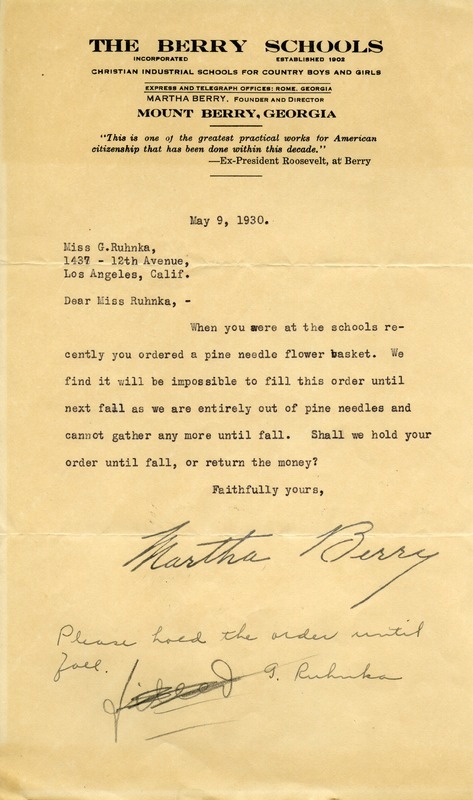 Martha Berry Digital Archive | Letter to Miss Ruhnka from Martha Berry, with written note reply. Miss Martha Berry, “Letter to Miss Ruhnka from Martha Berry, with written note reply..” Martha Berry Digital Archive. Eds. Schlitz, Stephanie A., Jordan Brannen, Aaron Jackson, Meg Ratliff, et al. Mount Berry: Berry College, 2014. accessed April 25, 2019, https://mbda.berry.edu/items/show/13885.